My wife, 7 year old daughter, and I visited Costa Rica in early February of this year. We saw a wonderfully varied landscape full of things to entrance any nature lover. We only wished our trip could be longer. If you can’t see my talk to the Hort on April 26, I hope I can still suggest to you some of the botanical pleasures awaiting the traveller in Costa Rica. This map shows where we went. Most travellers in the past have gone to San Jose (1), in the central highlands, but our flight took us to the new international airport near Liberia (2) in Guanacaste Province, the "cowboy country" of Costa Rica. We stayed on the Pacific near Playa Panama (3), and travelled inland to Arenal Volcano (4) and the Monteverde Cloud Forest Preserve (5). Most of us tend to think of tropical rain forest when we imagine tropical landscapes, but Costa Rica, although it has rain forest in the eastern, Atlantic part of the country, contains many other climate zones and ecological types. One of our first surprises on landing was the flat, sere landscape of the grazing lands in the valley of the Rio Tempisque. We could easily have been in the Prairies in a droughty August. The occasional low, spreading tree rose up above the waving grasses, but on the whole the botany on offer looked, well, rather boring! As our bus drove us to the coast we went through a small range of rugged hills, too steep for grazing, and therefore still preserving some of the native forest. Again to my surprise, more than half of the trees were bare, and most were rather short - not the towering giants of my dreams. The ride was enlivened for my daughter by a stop under a tree in which a family of howler monkeys stared down curiously at the tourists. For myself, the first really interesting sight was a number of trees covered in bright yellow blossoms, each about the size of a fist. These were the blooms of the "Wild Cotton" tree, Cochlospermum vitifolium. The common name comes from the floss of the seed pods, which is used to stuff pillows and provide a local cotton substitute. This beautiful tree is like many in western Costa Rica in blooming from December to April when the tree is leafless. This season is known to western Costa Ricans as "summer", since it is the hot dry season. May to November is known as "winter" because the clouds and rain make it feel cooler then, although the air temperature difference is not great. Next to the beach a small, peculiar forest grew. Near the shore Jacarandas were dropping their bluish mauve, trumpet shaped blooms on the sand when the wind blew. Although planted throughout the tropics, the Jacaranda species are native to tropical America and grow wild there. Inspect the trumpets closely and you may be reminded of the shape of our North American Trumpet Vines, Bignonia capreolata with red and yellow flowers, native as far north as Virginia, and the more commonly seen Campsis radicans, which reaches Pennsylvania and Illinois. Both are vigorous growers on a southern wall and bear masses of flowers attractive to hummingbirds. The family Bignoniaceae is shared with numerous other showy bloomers, most of them tropical. There are many more vining species, but a surprising number of large trees. Catalpa is the only tree from the family commonly grown in Toronto. A well grown Catalpa makes a magnificent specimen tree; I remember a lovely example in Riverdale at the corner of Hogarth and Ingham Avenues. As our two weeks passed, more and more trees in this leafless, dry forest came into bloom, with a wonderful variety of flower forms and colors. In fact, in the seasonally wet-dry areas of Costa Rica, a common growth pattern is for flowering to precede the onset of the rainy season by 1 to 3 months. Orchids are at their best in March and April, just before the rains, while the larger trees can afford to come into bloom earlier. The Pacific coast is sunny, hot, and dry in February - excellent for sunbathers and swimmers. A vigorous trade wind usually blows from the northeast, reaching daytime speeds of up to 50-60 km/hr. The combination of sun, no rain, and intense wind makes for a very desiccating season, so its not too surprising to come upon many species of cacti growing in the shrub layer of the forests, some of them rivaling in size the majestic saguaros of the Sonoran desert. These cacti get sun only in "summer" (our winter) and live in deep shade and constant rain in "winter", so they are often found on rocky slope or wherever the drainage is good. What is more surprising is to see how many of these cacti are epiphytic - growing on the branches of trees, with no contact with the soil. "Epi-phyte" literally means "upon a plant", which is where we saw these cacti - often sprawled out along large branches, held on by their aerial roots. If you can remember "epiphyte" then you can remember "Epiphyllum", a genus of these cacti with at least three species native to Costa Rica and about 15 more species found in Central America. The Epiphyllums are one of the most glorious of house plants, bearing giant flowers, gaily colored in many of the modern cultivars. They are typically grown in hanging baskets to emulate their native conditions. Closely related to Epiphyllums is the cluster of plants commonly known as "Night Blooming Cereus". 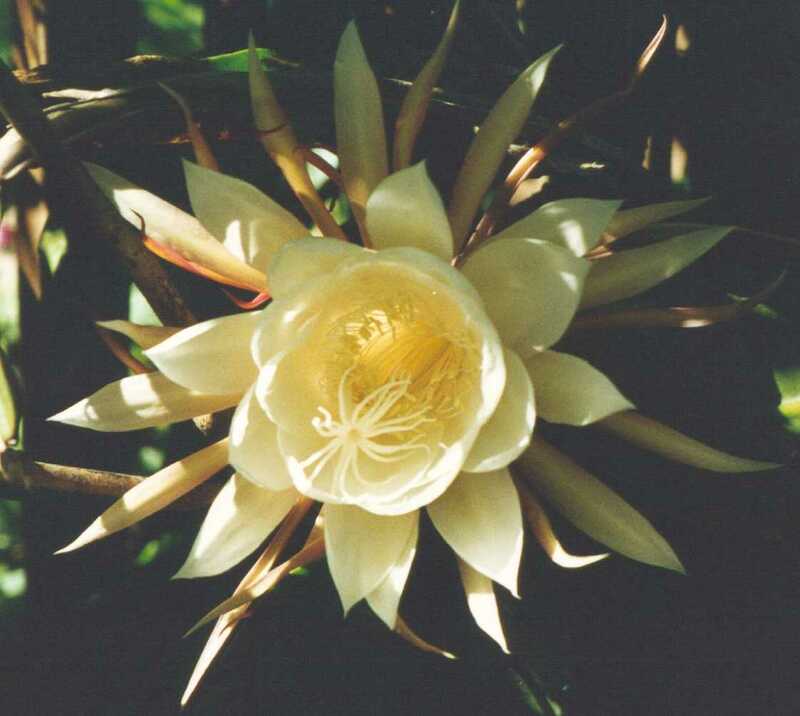 These used to be in the genus Cereus, logically enough, but the botanical taxonomists have reserved this name for cacti mostly from South America, and have exiled the parent species of the night blooming cereus to various genera such as Hylocereus, which are mostly from Central America and the Caribbean. Hylocereus undatus is the one most commonly grown in our homes. My own specimen has to be pruned down to 8 feet tall to fit in the house, but I once read of a giant specimen overwintered in the atrium of antebellum plantation house in Mississippi, brought out in summer by a squad of strong men to the patio to perfume soirees with its fantastic white, foot-long blooms. On our back deck they tend to open one to two hours after sunset, and close just around sunrise. I would love some day to see the gigantic night-flying moth, or perhaps a bat, which pollinates this monster of the Costa Rican dry forests. Looking up is a good plan in coastal Costa Rica, for you may see the "chicken of the trees", as hungry natives call their iguanas. It can actually be rather disturbing to the tourist to be scanning a tree limb for orchid, bromeliad, cactus, or begonia, only to discover something left over from the age of dinosaurs! Mature adults can grow up to 4-5 feet long and really do look as if they lost their way to the beach somewhere around the end of the Cretaceous. In the heavily populated tourist enclaves they are less abundant, but some people staying at our hotel told of being taken to a remote beach by boat for a scuba expedition and there encountering herds (flocks? gangs? millennia?) of hundreds of iguanas, hissing in an unwelcoming way. Fortunately, they are not carnivorous (if you’re not an insect), so there is no need to lock away the children. I could go on much longer about the coastal zone, but the newsletter is only a few pages long so I should mention briefly the area everyone wants to visit, the central highlands. The continental divide runs down the spine of Costa Rica and in most places is made up of surprisingly tall volcanic mountains (some over 3 km high, and many over 2 kms). Since they are often only 30-50 kms from the Pacific, the last 10 kms of the drive inland can be steep and winding to an extreme. Add to this a rather casual definition of "road" (anything a mule might pass over in the dry season), torrential "winter" rains, and the fact that several of the volcanos are still active, and you have a recipe for interesting tourist travel. Most sensible people take tours to these spots, riding in large, comfortable, air-conditioned buses driven by experienced drivers. Naturally, this meant that I had to drive myself in a small rented 4 wheel drive vehicle. After all, how else could I stop whenever the monkey, vulture, mango, or volcano by the roadside needed its picture taken? As you leave the lowlands, the pastures gradually take on hints of green, and the cows keep on munching. I had been looking forward to seeing the transitional forests of the dry-wet zone at 1000 meters elevation and up, but they’ve almost all been converted to cheeseburger production. Where patches of forest remained, it was fascinating to watch the species composition change with every few hundred meters of elevation gained. Not that I knew what the new (or old) species were, but enough of them were in bloom that you could see an ecozone change just by the change in color of the dominant flowering species. Gradually the growth of epiphytes becomes more and more luxuriant, until finally the bare branches of the trees are as shaggy as a hirsute sloth with bromeliads and orchids. One such tree with delicate pink blossoms and bromeliads with flaming red leaves compelled a stop in a rather dangerous spot on the road. 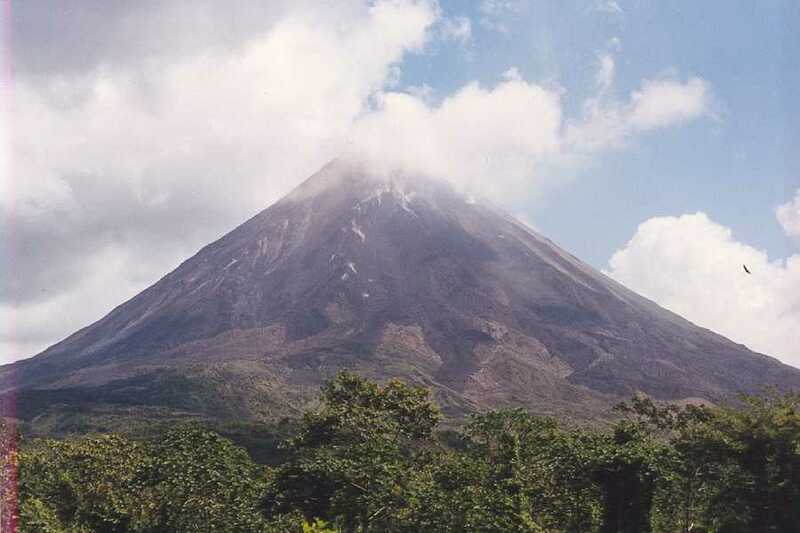 Arenal Volcano has built an entire new mountain adjacent to its old cone in the 31 years since 1968. Explosive smaller eruptions are constant, every hours or so. These manifest as blasts of smoke, ash, and the occasional house-sized boulder flung down the slopes. But the lava stays mostly within the crater these days; it hasn’t flowed down the mountainside for the last 4-5 years. Adjacent to the volcano, but safely out of reach of its dangerous pyroclastic flows, are a national park and a private preserve, the Arenal Volcano Observatory Lodge. If you book a long time in advance, you can spend a noisy night about as close to an active volcano as any sane person wishes to be. During the days, the forests around the lodge are crammed with spectacular birding, waterfalls, horseback rides, wild animals, and yes, even some interesting plants. My second trip I did alone (the pleasure of the driving perhaps having worn a bit thin for wife and daughter). Suffice it to say that one stretch of 30 kms took more than 2 hours, in 4 wheel drive. But once I had survived the road there, I had a glorious 24 hours in Monteverde. Those cheeseburgers ate up the mid-level forest, but in an odd way they helped preserve the highest "cloud forest" just below the divide. A group of American Quakers moved to Monteverde almost 50 years ago to start a dairy cooperative. They cut forest at lower elevations, but preserved the highest cloud forest to ensure the streams irrigating their pastures would flow throughout the dry season. From this start a huge preserve of some of the most threatened and unique forest types in Central America has grown. Skilled, well-trained nature guides are available to lead you through the preserves, so you can actually identify some of what you see. Without the help of the guides, we would never have seen the Resplendent Quetzal, a feathered blob high, high up which had every birder in the party all atwitter. But best of all, to me, was the story of some of the 40,000 hectares (that’s almost 100,000 acres, folks!) of forest added to the original preserve through the donations of schoolchildren around the world. "B.E.N", or Bosque Eternel de los Niños, means "Children’s Eternal Forest". It is a private preserve whose lands have been bought entirely with contributions from school classes. The story starts with a Swedish schoolteacher who visited Monteverde...but I fear I’ve tested the Editors’, and the faithful Readers’, patience quite enough. If you want to find out about BEN, begonias, tree ferns, butterflies, monkeys, and still more cheeseburgers, you’ll have to come to my talk on April 26. See you there!